/ˈtɛkɪtɜːn/ (adjective) the wordless state of a geek deep in hacking. So first I will show off a bit more frogspotter and then talk about #melhack as an event. MarkerClusterer looks great… in fact, maybe it looks too good. I do prefer the colour explosion of seeing all the different coloured markers directly. With MarkerClusterer, the “cluster” markers have their own colour scheme which is just related to the total number of markers. I can’t figure out a way to preserve the different species-ness of the markers when they get turned into clusters. 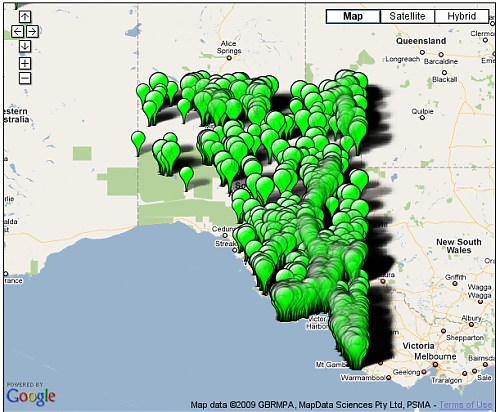 But, OTOH, with MarkerClusterer I can actually display all 6,700 points on the map, with minimal complaint from Firefox. So… that’s a tradeoff. 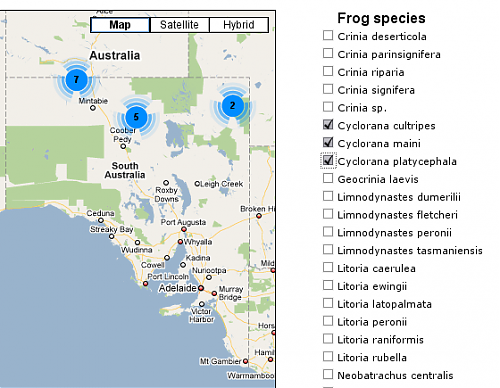 So the pop-ups now have a link – to pages at Frogs of Australia, like Neobatrachus centralis. I was so happy to do that because Frogs of Australia have an awesome pretty/clean URL scheme. No API or searching or anything needed! Drop in a templating system…hmm, maybe Mako? That’s all rather ambitious given I’m not devoting any more consecutive 24-hour stretches to this project, but you never know. :) Maybe I’ll be inspired for the MashupAustralia deadline this Friday. Or maybe I’ll work on it this Saturday at the GGD Afternoon Hack, even though the deadline is past it will still be a fun project. Even though I know how simple it is to put together something with Google Maps, there is still something magic about seeing your dots show up on a map. Even other techies I showed it to over the weekend had the same reaction. 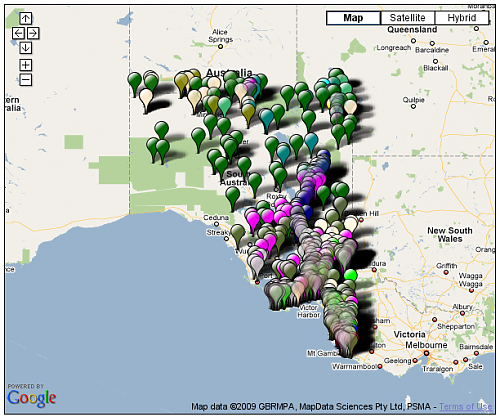 During my presentation of frogspotter at the end of MelHack, I was corrected by Dr Gruen about where the data came from — I had wrongly assumed it was recorded by South Australian public servants. But no! It’s from the public. Pretty awesome. MelHack - But does it have frogs? Two interesting things to come from that have been the Mashup Australia competition and the data.australia.gov.au portal, which is really cool but I am afraid will not have a life much beyond the competition… hopefully I’m wrong there. The NSW state government is also doing a similar thing, although they announced it earlier and released their data later. As part of the Mashup Australia competition, the taskforce organised a “hacking event” in Canberra called GovHack (see also SMH story). Sydney had not one but two similar events, hosted by Open Australia and Google, and until quite late it looked like Melbourne was going to miss out. At more or less the last minute, Lonely Planet came to the rescue and converted their OpenSocial/LP API hack day to also incorporate the GovHack stuff. And hence we have MelHack where I find myself for the weekend. This morning I also gave a short presentation on how to use Wiki[mp]edia data. You can see my slides on Slideshare. Feel free to ask me for more detail because they’re pretty sparse. So now comes the 24 hours to hack. Unfortunately I don’t have any great society-transforming idea in mind, and the data sets at first glance don’t help. The interesting ones are sparse, or it seems an interesting app might combine 3 or more of them, whereas I’m pretty sure I should start with just 1 and make sure I can work with that, before using any more. So what to do? Well, when in doubt, why not go with frogs. 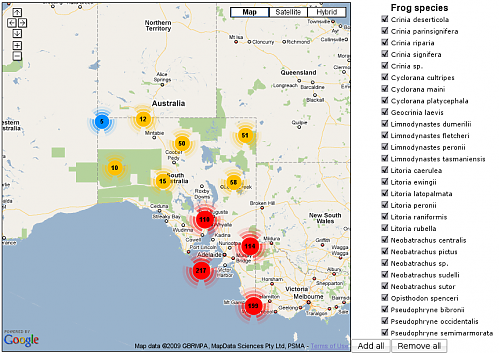 The South Australian frog atlas contains over 6,700 sightings of frogs. 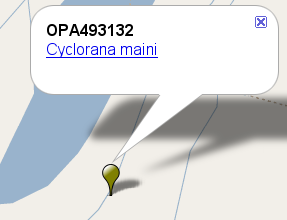 This is what happens when you convert the CSV to XML and basically just chuck them all on a map. I haven’t worked with Google Maps before, but maps do seem to be a vital element in mashups, so it’s a good a time as any to learn. Text © Brianna Laugher, licensed CC-BY-SA-3.0 unless stated otherwise. Design is based on Enterprise, licensed CC-BY-2.5.